Here at ChiIL Live Shows and ChiIL Mama our hearts go out to Stacy Keach's family and friends and we wish him a speedy and full recovery. My husband, Dug, has worked on location sound for numerous American Greed episodes for years now, a long running CNBC show that Stacy Keach narrates. I was also at the press opening where Goodman halted Pamplona, and for obvious reasons, we won't be reviewing unless a remount happens down the road. 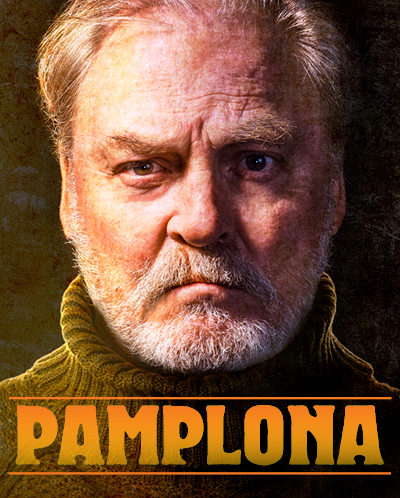 After a week of medical observation, it is now confirmed that stage and screen star Stacy Keach experienced a mild heart attack during the May 30 opening night performance of Pamplona, a one-man show by Jim McGrath. After it became clear that Keach was struggling, the performance was halted midway by Goodman Artistic Director Robert Falls. According to doctors, Keach is expected to make a complete recovery following a period of cardiac rehabilitation and rest. As previously announced, all remaining performances of Pamplona have been canceled; however, plans to reschedule the production are underway. “On behalf of Stacy Keach, his family and the Goodman, we would like to extend our gratitude for all of the generous support and concern shown to Stacy this past week. I remain awed by Stacy’s courage and strength after experiencing such a disturbing event; his spirits are high and he is resting and recovering comfortably. Jim, Stacy and I look forward to continuing our collaboration on Pamplona,” said Artistic Director Robert Falls. McGrath’s 80-minute, world premiere production starring Keach as the iconic American author Ernest Hemingway was scheduled to run May 19 through June 25 in the Goodman’s 350-seat Owen Theatre. Keach, who has no understudy given the unique nature of the play and his extensive involvement in the project’s development, completed every preview performance from May 19-28. The May 30 opening night was halted mid-performance, and the following three performances were cancelled as Keach underwent medical testing. Ticket holders will be offered a full refund to Pamplona, or tickets to the upcoming Ah, Wilderness! by Eugene O’Neill, directed by Steve Scott. A Goodman Theatre Ticket Services representative will be in touch, or patrons can call 312.443.3800 or visit the box office in-person at 170 N. Dearborn (the box office is open daily from 12 noon to 5pm; on performance days, it remains open until 30 minutes past curtain). The Goodman is grateful for its Pamplona sponsors, including The Elizabeth F. Cheney Foundation (Major Support) and Hinshaw & Culbertson LLP (Contributing Sponsor) with additional support from the Director’s Society.